You wish to digitise conclusions of contracts, releases, quotations and orders? In a personal and free webinar we present the optimum solution for your business. Register here or contact us by telephone. Smartphones, tablets, working in the home office or on the go: Our world of work has become digital and mobile. Also at the workplace in the office we have become used to procure what we need at any time with just a few clicks. In the digital age, companies gain competitive advantage by signing documents online and exchanging the same within minutes - whether in the office or when on the move. With FP Sign you can focus on what is essential and digitally sign contracts, offers, forms and certificates fast and reliably , and have them countersigned by your business partners - wherever and whenever. In a free webinar, we explain how you can set up your document and contract processes to be more efficient and significantly faster. In a telephone briefing, as a starting point, we collect advance information on the process that you wish to digitalise. In the webinar we illustrate how the digital process might look instead of an analogue process. You have the opportunity to ask those questions that are being discussed in your company with regard to the introduction of a digital signature solution. Following the approx. 40 minute webinar there is the opportunity to set up and agree a workshop to increase and deepen the content worked out so far and to model the new processes. Register now for your free webinar! Easy, fast and reliable: your competitive advantage. Contracts, approvals, notifications, confirmations of offers, NDA - FP Sign enables transparent business in a matter of seconds. Different signature levels ensure authenticity and in this way provide for the archiving of digital documents. FP Sign was developed in Germany by FP Mentana-Claimsoft GmbH and uses computer centres in Germany, certified by the Federal Office for Information Security (BSI). The FP Sign software is eIDAS compliant and provides for the statutorily prescribed long-term archiving. Due to the innovative character, security features and its high scalability FP Sign is an excellent solution for medium-sized companies. 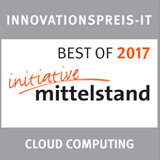 FP Sign was awarded the “Innovationspreis-IT” (IT Innovation Award) in the category Cloud Computing and thus belongs to the Best of 2017. FP Mentana-Claimsoft is a certified provider of the qualified Trust Service “Delivery of electronic registered mail” in accordance with the European signature regulation eIDAS. Further information on the certifications and memberships can be found on the website of FP Mentana-Claimsoft. eIDAS conform remote signature "Made in Germany"
Some company-relevant documents require the written form in order to obtain legal validity or maximum security through encryption. The qualified electronic signature (qeS) is the highest and most secure signature level. 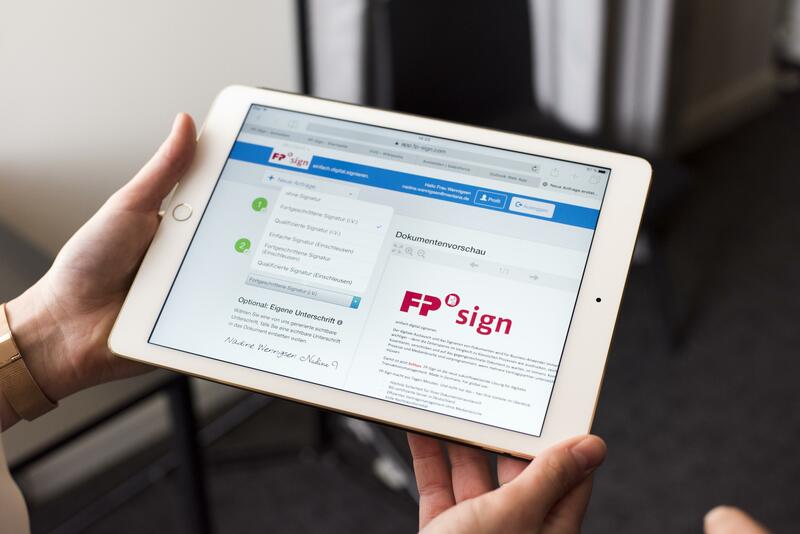 The exclusive cooperation between FP Sign and sign-me from Bundesdruckerei enables you as FP Sign User to use the qualified electronic signature with a personal certificate. sign-me complies with the strict requirements of the eIDAS regulation for remote signatures. This was confirmed by TÜV Informationstechnik GmbH in a complex test procedure and the Federal Network Agency by being included in the national eIDAS trust list. This makes "sign-me" the first eIDAS-compliant German remote signature solution. More information about sign-me as well as an FAQ can be found here. You wish to trial FP Sign? Register now and use FP Sign free of charge for three months! FP Sign is the perfect solution across all sectors and disciplines for signing and exchanging documents independent of time and location. Scalable packages, no training costs and a high level of integration capability offer new options for start-ups, medium-sized companies and groups of companies when it comes to digitalising document processes without media discontinuities. Your field of activity is not shown here? All prices plus statutory value-added tax. You wish to get to know FP Sign? Please contact us! *Fields marked by * are mandatory. For more than 15 years FP Mentana-Claimsoft GmbH has been specialising in the area of digital signatures and offers a comprehensive product range for the protection and securing of electronic documents and for legally secure communication.